(It seems like I’ve been blogging mostly politics these past few weeks. Here’s a bit of whimsy… the first in a possibly new series of nostalgia telly posts). The Adventure Game lurks dimly in my memory and sometimes I worry that I’m the only person who can recall it. I think it was on at about 6pm, possibly on a Thursday, but definitely on BBC2. I remember me and my brother were always keen to watch and totally enthralled as we did. But looking back, I’ve got to wonder what we were interested in. The premise of The Adventure Game was surreal: low grade TV personalities were transported to a faraway planet to do battle by puzzle with a gang of shape-shifting aliens and a shivering aspidistra. 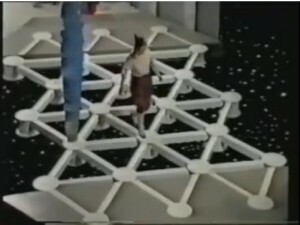 Over the course of the show, contestants would struggle to get their hands on coloured plastic tokens (drogna) by engaging in mind-bending lateral thinking games. The overall prize was passage home to Earth. Gronda gronda. The finale and highlight of the show was the dreaded vortex. Each contestant was required to traverse a triangular grid (I was always scared they might fall into space below) without being vaporised by the vortex. See the video below for more elucidation. I was always particularly pleased when a Doctor Who star was on The Adventure Game and seem to recall Janet Fielding (Tegan Jovanka) being on it a few times. But more likely were the likes of Johnny Ball or even Richard Stilgoe (who I knew was a bit naff even aged 6). There are a few fragments of The Adventure Game on Youtube, but alas not a whole episode as far as I can see. But what shines through it all is just how what a low-grade, mish-mash of a smug show The Adventure Game really was. The aspidistra was the grandfather of the other Args, Rangdo, who shook when he was angry and was controlled by Kenny Baker who later controlled R2D2. In the first series while he was still in human form, he was played by Ian Messiter, creator of Just a Minute. And without The Adventure Game, would we have had The Crystal Maze? I used to love the Adventure Game. A friend of mine used to run the official fan site, but I think she’s given up now. I remember someone ended up with a ham sandwich rather than a crystal and used to it discover where the vortex was. I loved watching the Adventure Game! Always wanted to have a go on the Vortex and to just be able to have a look at the Drogna! Do you know if you can get it on dvd or video? If not what websites or tv channels may show it? ive tried Youtube they just show clips! would like to see a full episode just once be so good! Emma: I don’t really think it is available. I was reliably informed through Youtube there is a small but loyal community of fans who trade the episodes on vhs only. Good luck finding them though. I am going to be reseeding all of the about 13 episodes that I have from the various series of The Adventure Game on UKNova.tv , I will also upload them to YouTube shortly. I contacted BBC Worldwide about it too, we badly need a DVD release of it, and some extras on the disc would be nice. If enough people contact BBC Worldwide then we may get a release. I worked on TAG for a long while, but I don’t have any recordings. If anybody can provide same, I’d be most grateful. wow.. yes.. would kill for a dvd of it now..
just watched some of the you tube episodes and want,, no need more.. anyone know of a source, torrent or alike where you can download or where you can even buy a dvd? its a real shame its not available..
i liked this show a lot back in 1981 when i first saw it on a rainy dull dark evening in november 81. A dvd would be great. Only 22 episodes i believe? Seemed like there were a lot more. The repeats probably made it seem like more. I like the look of the show too, it was modern then because real life was a lot browner lol in comparason very hitch hikersesque and colourful and the games like that vortex were rivoting and funny. I’d like to see it again. We Would have more chance of getting Challenge TV to repeat Series 4 & with the chance of them playing Series 3 a the same time as these are the only TWO Series that are complete as there are missing episodes from the the other two series. A DVD would be good but the way the BBC are at the moment there is not much chance, A massive petition would need to be started to get some action, BBC WORLDWIDE are the ones to email about future released DVD’S many would need to mail them also. I would kill for some drogna!